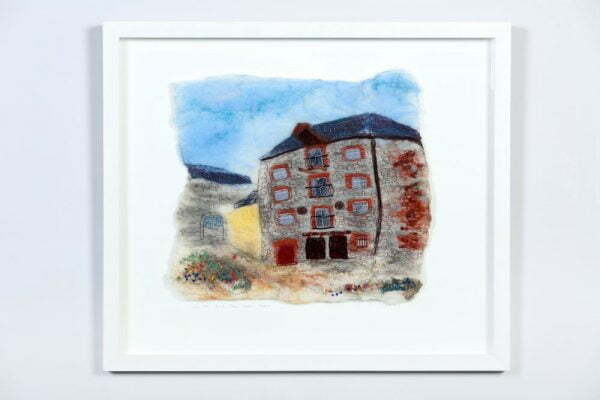 No 97… is a large wet felted framed wall art depicting one of Dundalk’s oldest buildings, once a grain store now Bridge Street Studios, Co Louth. Home to 8 working artists spread across 3 storeys, this is where the magic happens, where the creative energy flows. The studio is my refuge, the place I bring my collected inspirations, my crucible for my ideas, my chosen haven in the heart of town. I made this piece in response to ‘Just Like Soho’ Exhibition 2018. an atmospheric piece depicting ‘Old Dundalk’ felted with added silks, free machine embroidery and hand stitch.